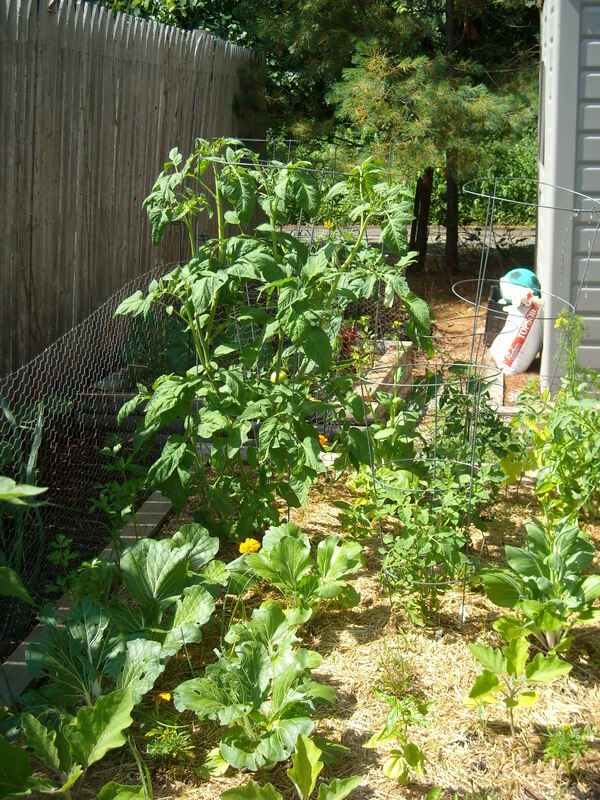 Signs of Progress: A Garden Update – Writer. Editor. Storyteller. The handsome fellow pictured here is Jerry, my cat. 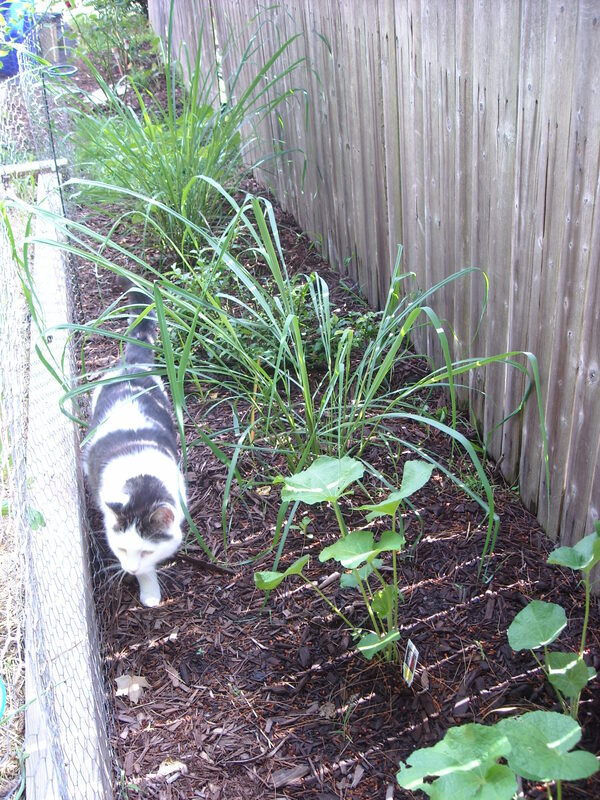 He’s prowling through the lemon grass, blueberries, and hollyhocks while I do some basic garden maintenance. Jerry is probably just as curious as I am about who has been nibbling the flowers off of my squash. I hadn’t planned on doing a garden update so soon. I figured it would be a monthly thing, but then we had a lot of sun followed by a lot of rain and more sun. Those things led to major transformations. I’ve started to get some ripe cherry tomatoes, and I’ve got one tomato plant so huge it will be taller than I am before long. I can’t even imagine the size of the fruit that will come off of it later this summer. 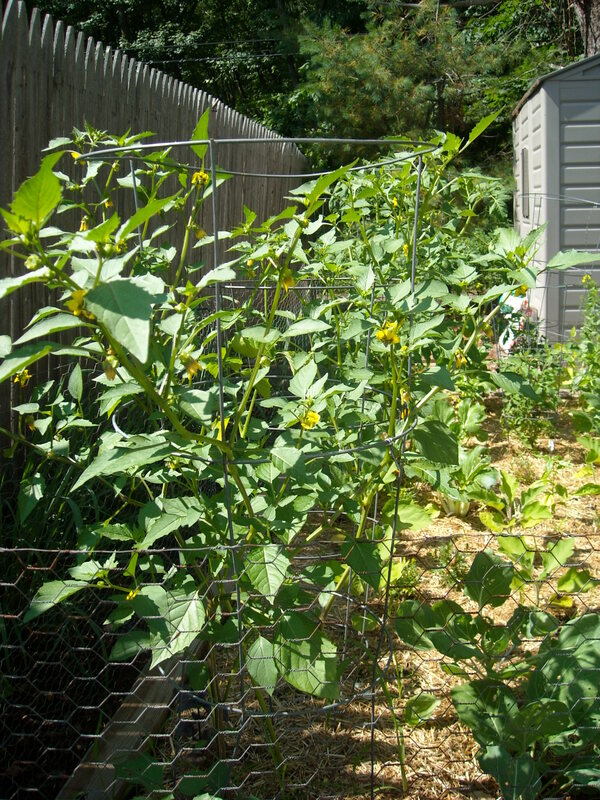 I also got some trellises and tomato cages to try and contain the squash. A trip to my favorite nursery also yielded some sugar baby watermelon starter plants. 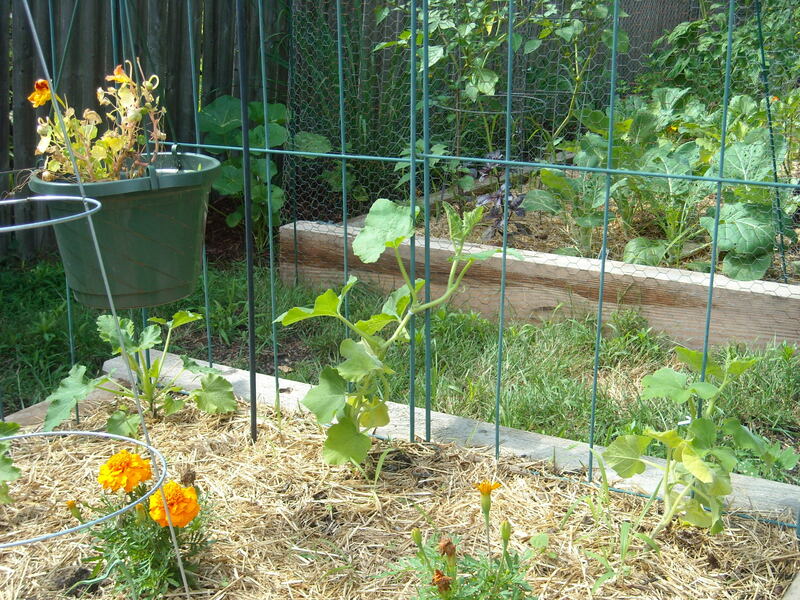 Of course, there’s not much room in the beds so I put them in the strawberry patch and just outside the raised beds. 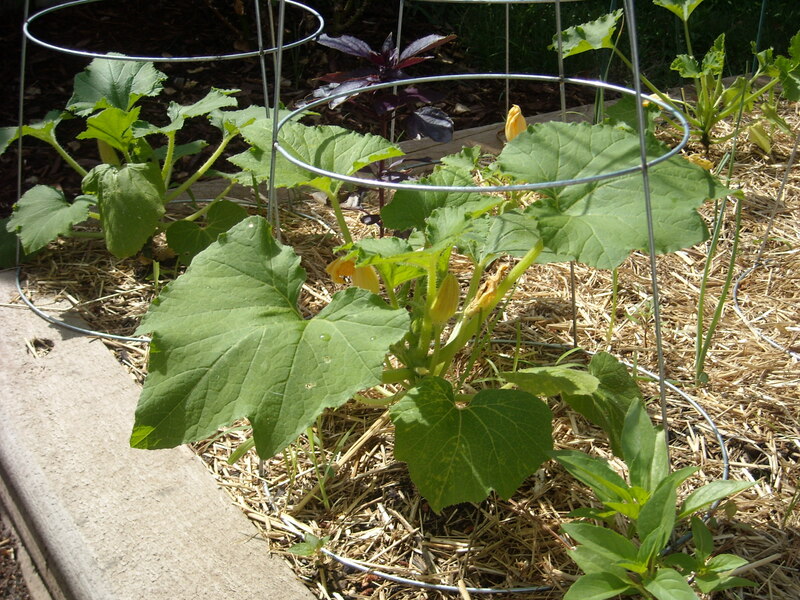 I also took a couple of seeds from a spaghetti squash that I cooked and planted them. Now I’ve got a couple of sprouting plants. I think I may have to relocate one of them. It’s really amazing to watch your food come to life. I keep thinking about being a little girl when McDonald’s used to hand out seed packets with Happy Meals (it’s almost too ironic to handle, I know). One year my mother and I planted pumpkins and watermelons. I don’t think the watermelons went anywhere, and the pumpkins got infested by bees. But here I am, probably 25 years later, with a veritable produce section in my backyard. These tomatillos are really starting to blossom…I’ve got one little “lantern” and lots of blossoms. It would appear that the epsom salt fertilizer worked. This is the first time I’ve ever tried to grow squash on a trellis. Let’s see how it goes. This is either a summer squash or zucchini, we’ll know once those flowers turn to a squash. 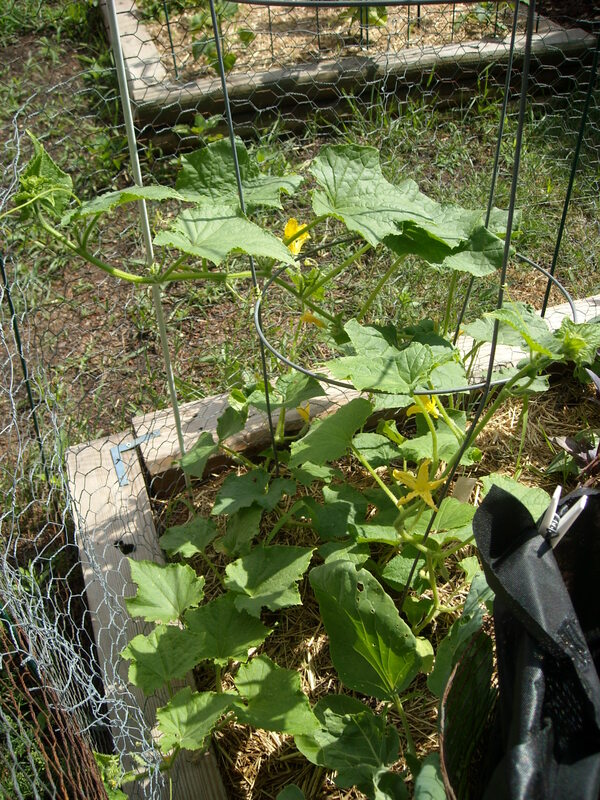 My cukes seem to be enjoying my liberal use of chicken wire. Hard to grow food where I live so enjoying it all through you this summer.